Treehouse | Oh Look! It's A Blog! We can light a match and burn it down. 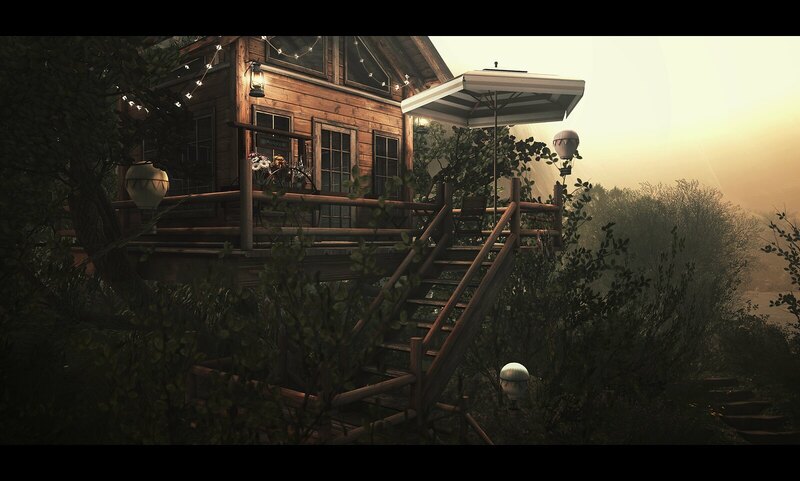 I loveeee this tree-house from Trompe Loeil though available at Uber, which opened yesterday. The days have worn away. I recently cleared my land ( as I tend to do wayyyy too often ) but prior to destroying everything I had set up the new houses from Dust Bunny available at The Arcade. I snapped a few pics just because I really liked the set up, even if it was short-lived. Both of these builds are rare gacha items, but really worth it. Her gachas are always amazing. Vespertine recently released a few new items available at The Season’s Story. This event runs for about another week so be sure to head over before it closes. I love the garden gates and I am very happy she included a mossy version since I tend to favor things that look aged or worn. These gates come in non mossy as well as several color options. I am using the iron version in my photos. To the details – I am off to make dinner. This is an adorable little set and worked perfect in my kid themed hideaway. The base is the rare item but the little sets can be used lots of ways and each set includes 1 fairy. You can see all the individual pieces here: Fairy Tree House.